Scuba Diving in the Philippines: 7107 islands, dive into more than 40,000 square kilometers of coral reefs teeming with a wide variety of marine life. Dive into deep-blue waters between more than 7000 islands. The Philippines contain a greater variety of marine life than anywhere else on the planet. More than 70% of our planet is covered with water, alluring and inspiring human imagination since the dawn of mankind. Thanks to daring and resourceful explorers like Jacques Cousteau, who invented the first SCUBA unit (Self Contained Under Water Breathing Apparatus), it is possible now for nearly everybody to visit the fascinating, colorful and spectacular underwater world for a limited time. Scuba diving as a recreational sport has become extremely popular in the last two decades, due in part to places like Cebu and the Visayas, with its awesome coral reefs, the wide variety of fish life and the ease of diving that the islands offer. Cebu and the neighboring islands are located in the middle of the Philippine archipelago; the location gives the region a relatively dry climate with not as much rain fall as Luzon in the north or Palawan in the west of the Philippines. 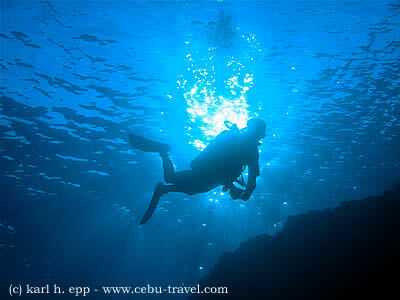 The result is that the waters around Cebu are usually clear, calm, and diveable year round. Water temperatures average a warm 78-84°F (25.6-28.9°C), with visibility averaging 70 - 100 feet (20 - 30m). The dive spots around Cebu, Bohol and Negros belong to the best the Philippines have to offer. Some islands are famous for big fish like thresher sharks, manta rays and, if you are lucky, whale sharks. Others offer fantastic coral gardens, steep, often overhanging walls and cliffs, teeming with reef fish. 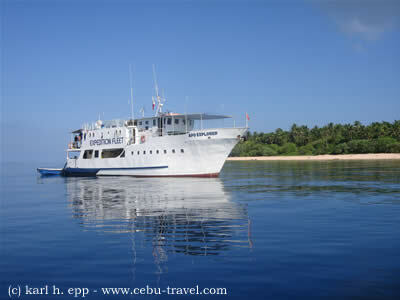 To get an impression read here an article about scuba diving in Pescador Island, Moalboal, Cebu: Join me on a dive in Pescador Island. A great dive center to dive with is Cebu Fun Divers. How to recognize a good dive center? A bad dive center can spoil your dive, your dive trip or even your whole dive vacation. What should a good dive center offer to satisfy certified divers? Often you get the first feeling for a good dive operations already when you enter the premises: Is it clean and neat? Is somebody knowledgeable there to acknowledge your presence, to approach you and to ask in a friendly and comprehensible way if one can be of assistance? If this is not the case you can assume safely that a dive operator who doesn’t understand the basics of customer care most probably neglects diving related standards and regularities, too. Unprofessional dive service can cost you the fun of the dive at best, ultimately your life at worst (though you may save some dollars on the initial price for your fun dive or dive course). In a well operated dive center a friendly divemaster or instructor should take the time to give you an environmental orientation, explaining dive schedules, the dive spots and general operation procedures in detail to you. Furthermore, you should be required to show your certification card and log book. If you didn’t dive for a longer period a check dive is standard operation procedure. Emergency procedures, the rescue chain and the availability of oxygen and the next decompression chamber should be part of every dive center introduction, especially in remote areas. Check out the rental equipment and never hesitate to ask questions. Look out for a displayed and updated sticker of the PCSSD (Philippine Commission on Sport Scuba Diving), if the dive center is a member at least the air is checked once a year. Scuba diving tanks are required for a hydrostatic test every 5 years, look for the stamp on your tank when you assemble your equipment. Some dive operators neither bother with hydrostatic tests for their tanks nor with regular filter exchanges for their compressor (cancel the dive if you can smell or taste the air when you breath through your regulator). At the dive spot a good briefing should be given and groups should be kept small. Additionally, respect of nature should be emphasized. If all the above topics are considered, go ahead and enjoy your dive. If you booked a trip with a dive/hotel package with us you will be given a thorough dive orientation and briefing before your first dive. Also, we recommend that you do a check-out dive as part of the briefing process before taking off on your own to shore dive or going on a dive boat. The main reasons for this are to have each diver check buoyancy so that damage to the reef is minimized or eliminated and also to check out the dive equipment, whether it be rented or owned. Most dive operators feature one-tank boat dives in the morning and early afternoons, as well night boat dive once or twice a week. If you book a multi-day dive package, you will usually receive unlimited shore dives as part of the package. Most dive shops in the Philippines also offer a complete range of rental gear for both snorkeling and diving, and will also provide beginner training for snorkelers. Some dive operations also offer guided snorkeling and night snorkeling. In addition to scuba diving, most dive shops offer a full range of instruction covering courses from entry to professional level. Almost all the certifying agencies are represented. PADI, NAUI, SSI, CMAS, IANTD, are a few whose certifications are available, PADI being by far the most popular. Many of the dive operators connected with us offer Nitrox fillings and tank rentals as well as Nitrox instruction and certification. Usually Nitrox can be purchased on a per tank basis or a weekly package. Some dive centers advertise with free Nitrox. But Nitrox comes at a cost everywhere, so many dive operators just hide the price tag somewhere else, like a generally higher dive price or in other services like food or accommodation. Just compare prices and look for hidden costs when you shop for Nitrox. Trimix fills and instruction are available only by few dive operators due to logistic problems and costs. Advanced technical courses as well as gear rentals are available. For scuba divers worldwide, DAN means safety, health and peace of mind. DAN is a global network of not-for-profit, member-based organisations and DAN Asia-Pacific has a region of responsibility that extends throughout Asia and the Pacific region. Please be aware that contact information and telephone numbers change frequently in the Philippines!!! Contact Person: Dr. Benjamin Luna M.D.